Team WOVEMBER’s Louise cannot resist a woolly song or poem. I was searching for a song for your Sunday listening pleasure and I found Click Go The Shears, an Australian folk song from the turn of the 19th Century. This is a totally new one on me, but may be familiar to some of you. The song perfectly describes large scale hand shearing operations, before the advent of the machine assisted age, and it also introduces us to the various roles and characters in the proceedings. Glory, if he gets her won’t he make the ringer go. And curses the old snagger with the bare-bellied yoe. With his shiny leggings on, just got off his horse. With brilliantine and scented soap — he’s smelling like a whore. Glory he’ll get down on it, before he stirs a leg. He works hard, he drinks hard — and goes to hell at last! Great imagery in this song; from hard work to hard drink, you can almost smell the fleece, sweat and booze. I particularly like the “Colonial experience man”, a ‘soft man’ of the English gentry trying out life on the station, but not quite achieving it well! There is in earlier version of this song from around 1891, which is the version sung in the video. Called The Bare Bellied Ewe in this version the old shearer is geared towards heaven, rather than hell, in the end! What is interesting is that also in 1891 there was the Australian Shearers’ Strike. A dispute between unionised and non-union wool workers broke out as the growth of wool export meant the work force grew too. Non-union workers were cheaper for stations to use and this resulted in large camps of striking shearers forming throughout Australia, particularly Queensland. The strike lasted 5 months with the shearers breaking strike due to no income, poor living conditions and hunger. This particular song must have been bittersweet to have been published during that time of unrest – illustrating exactly the type of graft that the union members were trying to fight for. The image below shows Chris Dyer hand clipping on his croft in Bressay, Shetland. 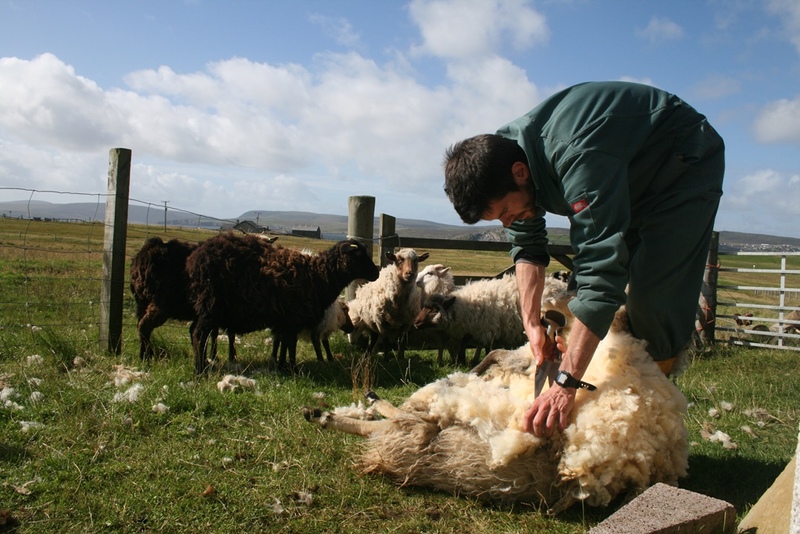 We will meet Chris later this week as he discusses the aspirations of a first time crofter.